A postprandial fall in BP occurs frequently in older individuals and in patients with type 2 diabetes. The magnitude of this decrease in BP is related to the rate of gastric emptying (GE). Intravenous administration of glucagon-like peptide-1 (GLP-1) attenuates the hypotensive response to intraduodenal glucose in healthy older individuals. We sought to determine the effects of exogenous GLP-1 on BP, GE, superior mesenteric artery (SMA) flow and glycaemic response to oral ingestion of glucose in healthy older individuals and patients with type 2 diabetes. 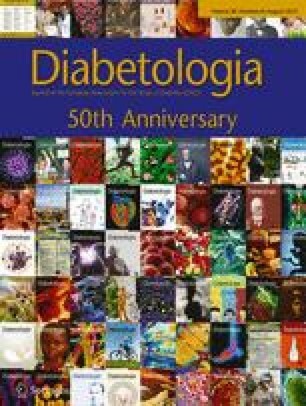 Fourteen older volunteers (six men, eight women; age 72.1 ± 1.1 years) and ten patients with type 2 diabetes (six men, four women; age 68.7 ± 3.4 years; HbA1c 6.6 ± 0.2% [48.5 ± 2.0 mmol/mol]; nine with blood glucose managed with metformin, two with a sulfonylurea and one with a dipeptidyl-peptidase 4 inhibitor) received an i.v. infusion of GLP-1 (0.9 pmol kg−1 min−1) or saline (154 mmol/l NaCl) for 150 min (t = −30 min to t = 120 min) in randomised order. At t = 0 min, volunteers consumed a radiolabelled 75 g glucose drink. BP was assessed with an automated device, GE by scintigraphy and SMA flow by ultrasonography. Blood glucose and serum insulin were measured. GLP-1 attenuated the fall in diastolic BP after the glucose drink in older individuals (p < 0.05) and attenuated the fall in systolic and diastolic BP in patients with type 2 diabetes (p < 0.05). GE was faster in patients with type 2 diabetes than in healthy individuals (p < 0.05). In both groups, individuals had slower GE (p < 0.001), decreased SMA flow (p < 0.05) and a lower degree of glycaemia (p < 0.001) when receiving GLP-1. Intravenous GLP-1 attenuates the hypotensive response to orally administered glucose and decreases SMA flow, probably by slowing GE. GLP-1 and ‘short-acting’ GLP-1 agonists may be useful in the management of postprandial hypotension. There is considerable interest in the cardiovascular effects of glucagon-like peptide-1 (GLP-1) and its agonists [1, 2, 3]. Phase 3 studies focusing on the blood-glucose-lowering effects of GLP-1 agonists indicate durable, modest reductions in systolic and, less consistently, diastolic blood pressure (BP), and a slight rise in heart rate (HR) [4, 5, 6, 7]. Postprandial hypotension (PPH), defined as a fall in systolic BP ≥20 mmHg within 2 h of a meal , is a common disorder, associated with substantial morbidity and increased mortality , for which current management is suboptimal . Groups most affected are older individuals, particularly those in residential care, and patients with autonomic dysfunction, including those with diabetes . In healthy older individuals and patients with type 2 diabetes, the postprandial fall in BP and increase in superior mesenteric artery (SMA) blood flow are greater when the rate of gastric emptying (GE), or intraduodenal glucose infusion, is relatively faster [11, 12], while gastric distension attenuates the fall in BP . GE in healthy individuals exhibits a wide interindividual variation of ~4–17 kJ/min (~1–4 kcal/min) ; this is increased in diabetes because of the high prevalence of delayed , and occasionally rapid, GE . The reduction in postprandial glucose following acute administration of GLP-1 [17, 18, 19] or ‘short-acting’ GLP-1 agonists [20, 21] relates primarily to slowing of GE but clinical studies relating to the effects of GLP-1 and its agonists on BP have not discriminated between effects on fasting vs postprandial BP. We recently reported that exogenous GLP-1 attenuates the hypotensive response to intraduodenal infusion of glucose at 13 kJ/min (3 kcal/min) . GLP-1 has a pressor effect when the ‘protective’ effects of gastric distension are bypassed, supporting the concept that it may have efficacy in the management of PPH. We hypothesised that i.v. infusion of GLP-1 would slow the GE of orally administered glucose in healthy older individuals and patients with type 2 diabetes and that this effect would be associated with attenuation of the fall in BP and increases in SMA flow and glycaemia. Fourteen healthy older individuals (six men, eight women, age 72.1 ± 1.1 years, BMI 26.0 ± 0.7 kg/m2) and ten patients with type 2 diabetes (six men, four women, age 68.7 ± 3.4 years, BMI 28.0 ± 1.2 kg/m2, duration of known diabetes 9.4 ± 1.8 years and HbA1c 6.6 ± 0.2% [48.5 ± 2.0 mmol/mol]) were recruited via a database or advertisement. Nine of the patients with type 2 diabetes were taking oral hypoglycaemic medication (nine taking metformin, two a sulfonylurea and one sitagliptin); none was using insulin. Antihypertensive medication was being taken by four of the healthy individuals (all angiotensin-converting enzyme [ACE] inhibitors) and five patients with type 2 diabetes (four ACE inhibitors and one calcium-channel blocker). None of the patients with type 2 diabetes had microvascular complications and all had normal plasma creatinine. Individuals with previous gastrointestinal disease or surgery, significant respiratory or cardiac disease or alcohol abuse were excluded. All medication was withheld for 24 h before each study day. Participants were studied on two occasions, separated by at least 1 week when they attended the Department of Nuclear Medicine, Positron Emission Tomography and Bone Densitometry at the Royal Adelaide Hospital at 08:30 hours after an overnight fast. On arrival, the participant was seated in front of a gamma camera and one i.v. cannula was inserted into the left antecubital vein for blood sampling and another into the right antecubital vein for infusion of GLP-1. A cuff was placed around the upper left arm to measure BP and HR. Commencing at t = −30 min, each participant received, in randomised, double-blind fashion, an i.v. infusion of GLP-1 (Bachem, Bubendorf, Switzerland) at a rate of 0.9 pmol kg−1 min−1 or control (0.9% wt/vol. saline, 154 mmol/l NaCl) for 150 min (i.e. from t = −30 min to t = 120 min) . At t = −3 min, they consumed a drink comprising 75 g glucose and 5 g 3-O-methyl-d-glucopyranose (Carbosynth, Compton, UK) dissolved in water (volume 300 ml), labelled with 20 MBq [99mTc] calcium phytate (Radpharm Scientific, Belconnen, ACT, Australia) within 3 min. At t = 120 min, the i.v. cannulae were removed. On one of the two days, autonomic function was then evaluated using standardised cardiovascular reflex tests . The protocol was approved by the Human Research Ethics Committee of the Royal Adelaide Hospital, and each volunteer provided written, informed consent. All experiments were carried out in accordance with the Declaration of Helsinki. BP and HR were measured using an automated BP monitor (DINAMAP ProCare 100; GE Medical Systems, Milwaukee, WI, USA), every 3 min for 15 min prior to the i.v. infusion (t = −45 to −30 min) and every 3 min between t = −30 and 120 min. Pre-i.v. ‘baseline’ BP and HR were calculated as an average of the measurements made at t = −39, −36 and −33 min. Pre-drink ‘baseline’ BP and HR was the measurement made at t = −3 min. PPH was defined as a fall in systolic BP ≥20 mmHg that was sustained for at least 20 min. Radioisotopic data were acquired for 120 min following the drink (60 s frames between t = 0 min and t = 60 min, then 180 s frames between t = 60 min and t = 120 min). Data were corrected for movement, radionuclide decay and γ-ray attenuation . The amount of the drink remaining in the stomach at 15 min intervals between t = 0 min and t = 120 min and, where possible, the 50% GE time (T50) were calculated . SMA flow was measured using a Logiq e ultrasound system (GE Healthcare Technologies, Sydney, NSW, Australia) and a 3.5C broad spectrum 2.5–4.0 MHz convex linear array transducer. Measurements were made prior to the commencement of the i.v. infusion and consumption of the drink (i.e. at t = −33 min and t = −3 min, respectively) and every 15 min between t = 0 min and t = 120 min. Blood flow (ml/min) was calculated as: π × r 2 × TAMV × 60, where r is the radius of the SMA and TAMV is the time-averaged mean velocity . Two measurements were made at each time point by the same investigator (LGT). Venous blood was collected at t = −33 min and t = −3 min, every 15 min from t = 0 to t = 60 min and at t = 90 min and t = 120 min. Blood glucose (mmol/l) was determined, using a glucometer (Medisense Companion 2 meter; Medisense, Waltham, MA, USA). Serum insulin was measured by ELISA (10-1113; Mercodia, Uppsala, Sweden); the sensitivity was 6.0 pmol/l and the coefficient of variation was 2.6% within, and 7.6% between, assays . Autonomic nerve function was assessed using cardiovascular reflex tests . Parasympathetic function was evaluated by the variation (R–R interval) of the HR during deep breathing and the response to standing (‘30:15’ ratio) and sympathetic function by the fall in systolic BP in response to standing. Each result was scored as 0 = normal, 1 = borderline and 2 = abnormal for a total maximum score of 6 . A score ≥3 was considered to indicate autonomic dysfunction . BP and HR were assessed as changes from the pre-i.v. or pre-drink baselines, whereas GE, SMA flow, blood glucose and serum insulin were analysed as absolute values. AUCs between t = −30 min and t = 0 min and between t = 0 min and t = 60 min were calculated using the trapezoidal rule. Changes in each variable over time (from t = −30 to 0 min and from t = 0–60 min) were evaluated with repeated-measures ANOVA. Differences between treatments and groups (i.e. treatment × group interaction) were evaluated with repeated-measures ANOVA. Baseline measurements and AUCs within groups were compared using Student’s paired t test. The number of participants was based on a power calculation, derived from our study in which GLP-1 in identical dosage was administered to healthy older individuals , so that there was 80% power to detect an 8 mmHg difference in the AUC for systolic BP between the study days. A p value <0.05 was considered significant. The studies were all well tolerated. There was no difference in age (p = 0.36), BMI (p = 0.17) or the score for autonomic neuropathy (p = 0.61) when comparing the healthy individuals with the patients with type 2 diabetes. None of the participants had autonomic neuropathy. In three healthy individuals and three diabetic patients, SMA measurements were not feasible due to intra-abdominal gas. Between t = −30 min and t = 0 min there was no change in systolic BP on either study day (Table 1). Following the glucose drink there was a rise, followed by a sustained fall, in systolic BP (p < 0.001 for both infusions), with no difference between the study days (treatment, p = 0.47, time, p < 0.001; treatment × time, p = 0.12), although at t = ~15–60 min mean systolic BP was lower on the control day (Fig. 1a). Between t = −30 min and t = 0 min there was no change in diastolic BP on either study day (Table 1). Following the glucose drink there was a fall in diastolic BP (p < 0.001 for both infusions), which was greater during the control infusion (treatment, p < 0.001; time, p < 0.001; treatment × time, p < 0.001). The AUC for diastolic BP was smaller during the control than during the GLP-1 infusion (p < 0.001) (Fig. 1b). Between t = −30 min and t = 0 min there was no change in HR on either study day (Table 1). Following the glucose drink there was no significant change in HR on either study day, although mean values were higher during the control than during the GLP-1 infusion (Fig. 1c). Between t = −30 min and t = 0 min there was no change in systolic BP on either study day (Table 1). Following the glucose drink there was a rise on both study days, followed by a sustained fall in systolic BP during the control infusion (p < 0.05) but not during the GLP-1 infusion (p = 0.32). Systolic BP was lower in patients receiving the control infusion (treatment, p = 0.06; time, p = 0.22; treatment × time, p < 0.05) and the AUC for the control infusion tended to be smaller (p = 0.06) (Fig. 1b). Between t = −30 min and t = 0 min there was no change in diastolic BP on either study day (Table 1). Following the drink there was no change in diastolic BP on either study day, but diastolic BP was lower in those receiving the control infusion than in those receiving GLP-1 (treatment, p = 0.14; time, p = 0.13; treatment × time, p < 0.05) (Fig. 1d). Between t = −30 min and t = 0 min there was no change in HR (Table 1). Following the drink there was no change in HR on either study day (p = 0.18). HR increased during GLP-1 infusion (p < 0.01), although there was no difference between the study days (treatment, p = 0.21; time, p = 0.94; treatment × time, p = 0.45) (Fig. 1e). There was no difference between the two groups in the AUC t = 0–60 min for systolic BP, diastolic BP or HR for either study day. The T50 on the control study day was 121.7 ± 11.7 min. GE was slowed by GLP-1 (e.g. retention at t = 120 min: control, 47.7 ± 4.6%; GLP-1, 71.4 ± 4.8%, p < 0.001) (Fig. 2a). The T50 on the control study day was 87.7 ± 10.4 min. GE was slowed by GLP-1 (e.g. retention at t = 120 min: control, 32.1 ± 5.3%; GLP-1, 63.5 ± 7.9%, p < 0.005) (Fig. 2b). The T50 on the control study day was shorter (p < 0.05) and the percentage of drink retained in the stomach at t = 120 min was lower (p < 0.05) in the patients with type 2 diabetes than in the healthy individuals. There was no difference between the groups in the retention at t = 120 min for the GLP-1 study day (p = 0.40). Between t = −30 min and t = −3 min there was a trend for SMA flow to be lower on the control study day (p = 0.06), without any change during GLP-1 (p = 0.50) (Table 1). Following the glucose drink there was an increase in SMA flow (p < 0.001 for both infusions); this increase was less during GLP-1 infusion (treatment, p < 0.001; time, p < 0.001; treatment × time, p < 0.01). The AUC for SMA blood flow was smaller during the GLP-1 than the control infusion (p < 0.001) (Fig. 3a). At the pre-drink baseline measurement, SMA flow was slightly less on the control study day than on the GLP-1 study day (p < 0.05) (Table 1). Between t = −30 min and t = −3 min there was no change in SMA flow on either study day. Following the glucose drink, there was an increase in SMA flow during the control infusion (p < 0.05) and no change during the GLP-1 infusion (p = 0.16). While there was no difference between the study days (treatment, p = 0.07; time, p < 0.01; treatment × time, p = 0.18), the AUC for SMA flow was smaller during the GLP-1 than the control infusion (p < 0.05) (Fig. 3b). There were no differences between the healthy individuals and the patients with type 2 diabetes in SMA blood flow at either the pre-i.v. or pre-drink baseline (Table 1) and there was no difference in the AUC 0–60 min for either study day. Blood glucose at pre-i.v. baseline was slightly less on the control day than on the GLP-1 day (p < 0.05) (Table 1). Between t = −30 min and t = −3 min, there was a modest decrease in blood glucose during the GLP-1 infusion (p < 0.05) but no change during the control infusion (p = 0.40). Following the glucose drink, there was an increase in blood glucose on both study days (p < 0.001 for both) which was less during GLP-1 infusion (treatment, p < 0.001; time, p < 0.001; treatment × time, p < 0.001). The AUC for blood glucose was smaller during the GLP-1 than the control infusion (p < 0.001) (Fig. 4a). At the pre-drink baseline serum insulin was higher on the GLP-1 study day (p < 0.01) (Table 1). Between t = −30 min and t = −3 min there was an increase in insulin during the GLP-1 infusion (p < 0.005) but no change during the control infusion (p = 0.26). Following the glucose drink there were comparable increases (p < 0.001 for both) in serum insulin on both study days (treatment, p < 0.05; time, p < 0.001; treatment × time, p = 0.37), although the AUC for serum insulin was smaller during the GLP-1 than the control infusion (p < 0.05) (Fig. 4c). Between t = −30 min and t = −3 min there was a slight decrease in blood glucose during the GLP-1 infusion (p < 0.05) but no change during the control infusion (p = 0.48) (Table 1). Following the glucose drink, there was an increase in blood glucose (p < 0.001 for both infusions) which was less during the GLP-1 infusion (treatment, p < 0.005; time, p < 0.001; treatment × time, p < 0.001). The AUC for blood glucose was smaller during the GLP-1 than the control infusion (p < 0.005) (Fig. 4b). At the pre-drink baseline serum insulin was higher on the GLP-1 study day (p < 0.05) (Table 1). Between t = −30 min and t = −3 min there was an increase in serum insulin during the GLP-1 infusion (p < 0.05) but no change during the control infusion (p = 0.71). Following the glucose drink, there was an increase in serum insulin on both study days (p < 0.001 for both). Serum insulin levels were higher during the GLP-1 infusion (treatment, p = 0.38; time, p < 0.001; treatment × time, p < 0.05), although there was no difference in AUC (p = 0.68) between the two infusions (Fig. 4d). Pre-i.v. and pre-drink baseline blood glucose levels (p < 0.001 for both study days) (Table 1) and the blood glucose AUC 0–60 min were greater in patients with type 2 diabetes than in healthy individuals (p < 0.001 for both infusions). Pre-i.v. and pre-drink baseline serum insulin levels were greater in patients with type 2 diabetes than in healthy individuals (p < 0.005 for both study days) (Table 1) but there was no difference in the AUC 0–60 min for either study day. In patients with type 2 diabetes the difference in AUC for blood glucose was inversely related to the difference in intragastric retention at t = 120 min between the control and GLP-1 infusions (R = −0.65, p < 0.05) indicating that the slower the GE the greater the reduction in glycaemia. There were no significant relationships between changes in BP or SMA flow and GE. This study establishes that acute, i.v., administration of GLP-1 (0.9 pmol kg−1 min−1) to healthy older individuals and patients with type 2 diabetes attenuates the fall in BP and rise in SMA flow induced by orally administered glucose and confirms that GLP-1 slows GE and diminishes glycaemia. The effect on BP is consistent with our hypothesis and supports the concept that GLP-1 and GLP-1 agonists may prove effective in the management of PPH. GLP-1 and GLP-1 receptor (GLP-1R) agonists induce a sustained elevation of BP in rodents [2, 3, 27], attributable to central and peripheral mechanisms, but not in larger-animal models  or apparently humans [29, 30]. However, in a recent study, a modest (~5 mmHg) increase in systolic (but not diastolic) BP, associated with an increase in cardiac output attributable to rises in stroke volume as well as HR, was evident in healthy middle-aged men in response to an i.v. infusion of GLP-1 (1.5 pmol kg−1 min−1) . It was suggested that the increase in cardiac output may be a compensatory response to vasodilatation elsewhere. The effectiveness of GLP-1R agonists in reducing BP in clinical trials of type 2 diabetes and obesity is most evident in individuals with higher baseline BP [1, 5, 6] and may be attributable to reductions in tubular sodium reabsorption  or central sympathetic output  as well as peripheral vasodilatory effects . In contrast to findings in rodents , GLP-1 and GLP-1R agonists do not appear to promote the secretion of atrial natriuretic peptide in humans [30, 31]. In our study GLP-1 had no effect on BP or HR in the 30 min preceding ingestion of the glucose drink, which reduced BP in both healthy older individuals and patients with type 2 diabetes. GLP-1 attenuated the glucose-drink-induced fall in diastolic, but not systolic, BP in healthy older individuals. In type 2 diabetes patients both systolic and diastolic BP post-glucose drink were greater following GLP-1 than control infusion. The magnitude of the effect of GLP-1 on BP was substantial (~10 mmHg difference) and may relate to the slowing of GE, but other mechanisms are likely to be important, particularly as GLP-1 reduces the hypotensive response to intraduodenal glucose . In healthy older individuals, orally  and intraduodenally administered  guar reduces the hypotensive response to glucose administered via the same routes, and the α-glucosidase inhibitor acarbose has comparable effects on the response to orally  and intraduodenally administered  sucrose. These observations suggest that the slowing of nutrient absorption from the small intestine is a critical factor. In view of recent observations made using a higher dose of GLP-1 , a direct pressor effect of GLP-1 represents an alterative explanation and it would be interesting to evaluate the effect of GLP-1 infusion without an oral glucose load. Cross-sectional studies have reported there to be a 30–50% prevalence of gastroparesis in longstanding type 1 or 2 diabetes [15, 39], although GE may be accelerated , perhaps particularly in ‘early’ type 2 diabetes . Our patients had type 2 diabetes of relatively short duration, good glycaemic control and no microvascular complications. The observed acceleration in GE may be an underestimate given that acute hyperglycaemia slows GE . The acute slowing of GE by exogenous GLP-1 is substantial [17, 18, 19], as we confirmed, so that the consequent reduction in glucose may be associated with a reduction, rather than an increase, in insulin [17, 18, 19]. While blood glucose levels were lower during the GLP-1 infusion than the control infusion, the overall glycaemic profile was predictably greater in patients with type 2 diabetes. That GLP-1 had a mild insulinotropic effect prior to the glucose drink is consistent with previous observations . In healthy individuals, blood glucose exceeded the threshold for an insulinotropic effect of GLP-1  only during the control day, whereas in patients with type 2 diabetes levels were above this threshold during both study days. This may account for why serum insulin was higher following GLP-1, compared with control, in patients with type 2 diabetes, whereas in healthy individuals, the opposite was observed. In healthy individuals, the reduction in blood glucose caused by GLP-1 was greater than we observed in response to an intraduodenal infusion of glucose at 13 kJ/min (3 kcal/min) , which is likely to reflect the slowing of GE. Glucose lowering per se also represents a potential confounder in interpreting the effects of GLP-1 on BP. Ideally, we would have included a positive control for the antihyperglycaemic effect of GLP-1. The glucose-stimulated increase in SMA flow was reduced in both healthy individuals and patients with type 2 diabetes when GLP-1 was administered. This effect is probably related to the slowing of GE rather than a direct effect of GLP-1, particularly as GLP-1 in identical dosage potentiated the increase in SMA flow induced by intraduodenal glucose . In interpreting these results other potential limitations should be recognised. While most volunteers were normotensive some were taking antihypertensive medication, although the medication was withdrawn for a minimum of 24 h. As the postprandial fall in BP is greater when the preprandial BP is higher , it is likely that the effects of GLP-1 will be greater in patients with hypertension. Although blood glucose was quantified with a glucometer, the observed changes appeared consistent between individual participants. All the patients with type 2 diabetes had relatively well-controlled, uncomplicated diabetes and studies of the effects of GLP-1 on postprandial BP in diabetes associated with autonomic neuropathy are warranted, given that the response to GLP-1 may be influenced by autonomic function . There is also potential for a discordance between the effects of i.v. and s.c. administration of GLP-1 on BP, as appears to be the case for glucose lowering in patients with type 2 diabetes and, possibly, the induction of upper gastrointestinal symptoms . Despite its importance, information relating to the dietary and pharmacological management of PPH is limited . The current study should be regarded as ‘proof of principle’ as we did not study patients with PPH. However, in the elderly, PPH probably represents a continuum (i.e. in healthy older individuals there is predictably a postprandial fall in BP, which is not the case in healthy young ). Given our observations, evaluation of the effect of GLP-1 agonists on BP in PPH is indicated. It will be important to determine whether the acute effects that we observed are maintained with chronic administration. We assessed the acute responses to GLP-1, and it is now recognised that the slowing of GE by exogenous GLP-1 is subject to tachyphylaxis with sustained exposure [43, 44]. Intuitively, once- or twice-daily administration of ‘short-acting’ preparations of GLP-1 agonists, such as exenatide and lixisenatide, which predominantly diminish postprandial glucose by slowing GE [45, 46], may have greater efficacy than once-weekly administration of longer-acting drugs, such as liraglutide and modified-release exenatide, where the slowing of GE appears to be modest with chronic use [45, 46]. In summary, in healthy older individuals and patients with type 2 diabetes, acute i.v. administration of GLP-1, in a dose of 0.9 pmol kg−1 min−1, attenuates the hypotensive response to orally administered glucose. This effect is associated with slowing of GE and reduction in SMA blood flow and glycaemia. These observations suggest the following: (1) GLP-1 agonists may be effective in the management of PPH and (2) studies relating to the effects of GLP-1 and its agonists on BP should discriminate between the fasted and postprandial state. The authors would like to acknowledge the Pharmacy Department, Royal Adelaide Hospital for randomisation and preparation of the study drug, the Department of Nuclear Medicine, Positron Emission Tomography and Bone Densitometry for their support in providing resources and R. Tippett (Discipline of Medicine, The University of Adelaide, Australia) and C. Tran (School of Pharmacy and Medical Sciences, University of South Australia, Australia) for technical assistance on the study days. This study was supported by the National Health and Medical Research Council (NHMRC) of Australia (grant 627189). LGT is supported by an Australian Postgraduate Award and a Dawes scholarship from the Royal Adelaide Hospital. KLJ’s salary is funded by an NHMRC Senior Career Development Award (grant 627011) and CFB’s salary is funded by an NHMRC Senior Research Fellowship (grant 627002). MH has participated in Advisory Boards and/or symposia for Novo Nordisk, Sanofi, Novartis, Eli Lilly, Merck Sharp & Dohme, Boehringer Ingelheim and AstraZeneca and has received honoraria for this activity. CKR has received research funding from Merck, Eli Lilly and Novartis. All other authors declare that there is no duality of interest associated with their contribution to this manuscript. LGT, MH, CFB, DP, CKR, AMD and KLJ were involved in the conception and design of the study. LGT was responsible for coordination, participant recruitment, data collection and interpretation and statistical analysis. MH and KLJ carried out data interpretation and statistical analysis. JES collected and interpreted data. AMD interpreted the data. LGT, MH, JES, CFB, CKR, DP and KLJ were involved in drafting the manuscript. SS collected and analysed data. KLJ had overall responsibility for the study. All authors critically reviewed the manuscript and approved the publication of this final version of the manuscript.